Cannabis: a Gateway to Rehab? This is the classic “gateway theory” argument: that people start off with using cannabis, and then move onto other drugs, like cocaine, amphetamines and opioids. The idea that cannabis is potentially a way out rather than a way in is the very opposite of what most people have been taught. The possibility of having a cannabis dealer “push” other drugs onto you, i.e. start a person off on cannabis, then try to introduce other substances to them. The “I’ve seen lots of people go from cannabis to harder drugs in the space of several years, even if they stop using cannabis after a while” or the “trying cannabis got them curious about using other drugs” story. The “I’ve seen people form negative habits after starting cannabis use, even if they don’t use other substances” story. As tempting as it is to palm all of these off as “anecdotal evidence”, it is worth mentioning that there are a few factors that give such arguments some weight. First of all, cannabis is illegal in many states, and this may well put some impressionable people in contact with less than favorable company. Some people may well try cannabis and think “the government’s been lying to me about this, so what other substances have they lied about?” There may well be people out there for whom cannabis is a negative. Yet, all the arguments for the gateway theory could be arguments for legalization! Legalizing cannabis can cut out most if not all black market trading, and prevent people from meeting violent criminals. Legalizing cannabis could help getting people to see cannabis use as “normal” and “something old fuddy-duddies do”, as opposed to something that’s mad, bad and dangerous to know. As for negative habits, legalizing cannabis could well help people seek help should they feel that they want to reduce or stop using cannabis – it becomes less problematic to admit to cannabis use to health professionals. There’s another question that could potentially upset the narrative surrounding the idea that cannabis is an entry-level drug: “If cannabis is a gateway drug, what about licit substances like alcohol, tobacco and prescription drugs?” Indeed, there is a lot of evidence suggesting not only that alcohol and tobacco should also be considered gateway drugs, but that they may actually be better indicators of future hard drug use than cannabis alone. There is just as much – if not more – merit to the “I got drunk at a party, stupidly tried something I shouldn’t have, and got too much of a liking for it” story as there is to the “I started off with cannabis” story. So, what’s the reasoning behind the idea of cannabis as an “exit drug”? There is a hidden question in here, which is “How do we treat drug addiction at the moment?” Though the path to sobriety is complicated, with different methods working for different people, there are usually two main answers: 1) quitting “cold turkey”; and 2) using other substances to help withdraw from the substance you’re addicted to. The problem with answer number 1 is that going cold turkey isn’t realistic – or even desirable – for most people, and there is a high rate of recidivism using this method. As for answer number 2, it is not unusual to prescribe alcoholics with benzodiazepines and barbiturates or opioid addicts with other opioids in order to beat withdrawal symptoms. 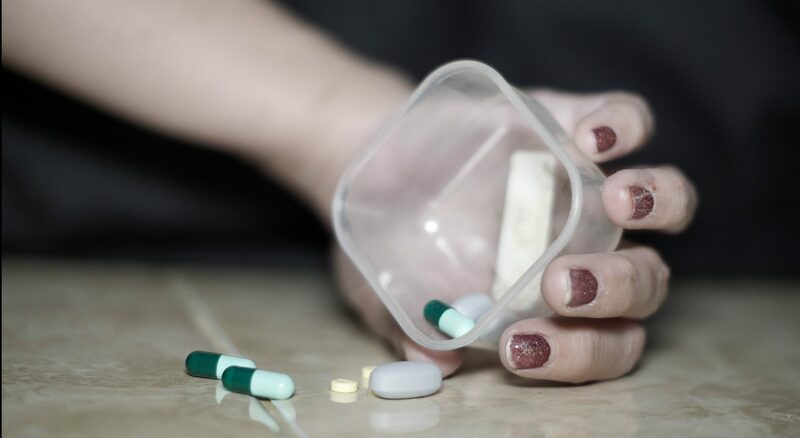 Although the rates of recidivism are generally slightly lower using this method, it is essentially replacing one drug with another drug that is just as harmful – and in some cases even more harmful – than the one you’re seeking to escape from. Joe Schrank, program director and founder of High Sobriety, knows this all too well. His Los Angeles-based treatment center uses medicinal cannabis as a detox and maintenance protocol for people with addiction. High Sobriety regularly sees and helps those suffering from addiction. Schrank recently celebrated 20 years of sobriety from alcohol and all drugs himself. One of the best benefits of cannabis he feels is the reduce in risk for the patient. Isn’t using cannabis to treat addiction essentially doing the same? Aren’t you using it to replace one drug with another? Although we’d prefer to move cannabis away from being seen simply as a “drug”, we already have an appropriate response to this: “Yes, we are using cannabis as a crutch. However, it’s a much safer crutch than the substances we use at the moment to treat drug addiction.” Prescription opioids and benzos have a death count. Cannabis use on its own does not. The possibility of death via overdose on cannabis is practically nil, which is a great safety margin even when comparing it to some of the most everyday and benign of drugs in the world! That some types of cannabis have a psychoactive effect can actually be of help rather than hindrance in this case. Many people like to use, say, alcohol because it’s a fun and social thing to do. Cannabis can still provide that fun, euphoric feeling without the person necessarily losing sense of all their faculties and decision-making abilities. This often means that they feel they can legitimately say at gatherings, “No, I don’t drink. I prefer to use a little cannabis instead – maybe a nice sativa for social situations.” Nobody likes to be left out of the fun, even if a person at a social event using cannabis is enjoying life on a different wavelength to a person using alcohol. So what drugs could cannabis help be an escape from, and why? This is a really interesting question, and one that definitely requires more research to get a solid, definitive answer from. We’ve spoken to many people who treat addicts who have said to us that cannabis is a very effective medicine for helping people addicted to various substances, although the two main ones are probably opioids and alcohol. However, cannabis could potentially treat addictions to all sorts of substances, including amphetamines, cocaine, benzodiazepines, barbiturates and more. The answer to “why?” comes down to our old friend, the endocannabinoid system, and the vast variety of effects cannabis can potentially have. If one were to assume that a person addicted to methamphetamine or cocaine enjoys being “up”, then a cannabis strain or product with a particular cannabinoid and terpenoid profile could help “approximate” those “happy, chatty, focused, energetic” feelings without the need for a far more harmful or addictive substance. Similarly, a person who enjoys the “down” feeling of opioids or barbiturates may find solace in a strain or product that helps sleep and relaxation. Moreover, as cannabinoid receptors are also involved in the role of pain detection, alongside the idea that cannabinoids could well be a partial agonist of opioid receptors, and you have a very effective replacement for far more addictive, opioid-based painkillers, biologically-speaking. One of the biggest problems for a person addicted to opioids is that they physically crave opioids as the body painfully readjusts to life without externally-derived endorphins. Cannabis – being a partial agonist – could help mitigate those cravings, which could be one of the reasons why having a medical marijuana program has lead to a reduction in opioid overdoses in the states where there is one. Of course, now that we have cannabis strains and products that produce little or no psychoactive effect, the accusation of “you’re just using it to forget the world exists” makes little sense if you’re not getting a psychoactive effect from using cannabis for addiction in the first instance, or if the effect is about as strong, psychoactive and addictive as drinking a cup of coffee! Can I develop a tolerance to cannabis? Yes, it is possible for a person to develop a tolerance to cannabis after a little while. This can be both a positive and a negative. The positive is that some tolerance to cannabis helps negate some of its negative side-effects, and the effects can be less overwhelming after a little while of getting used to your medication. The negative? It can take more and more of the same strain to get the same therapeutic effects over time. So, how do people prevent this from happening? Some take what are called “tolerance breaks” or a “t-break”, which means taking some time off from using cannabis, usually for between a few days and a couple of weeks, in order to reduce the amount they need. Another technique is “strain switching”, which means using a different strain in order to get the desired therapeutic effects. Utilizing different cannabinoid and terpenoid concentrations can help keep tolerance to a particular strain from developing. I’m still in shock, Doc, and the concept of cannabis as an exit drug still confuses me! That’s OK, and it’s an understandable feeling. The “Have I been brainwashed? Do I need deprogramming? Is cannabis potentially safer than acetaminophen (Paracetamol)?” questions start to come thick and fast when looking at how we treat not only addiction, but also how we approach pain, medical safety and prescription processes in medicine as a field at large. We have often thought of cannabis as being a sort of metaphor for the problems in many fields, from medicine to various social and economic problems, and this addiction treatment and how we approach medical safety is definitely one of them. And here’s the thing: legalizing cannabis and having a medical marijuana program could well be the answer to solving so many of these problems! Let’s hope government present and future can see the wood for the trees and have the foresight to legalize cannabis and do the necessary scientific research to show us its medical efficacy.